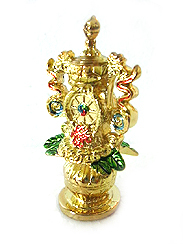 This powerful eight auspicious object of Tibet is an ultimate generator of good feng shui. The energy emitted from 8 Auspicious Objects becomes even more auspicious and powerful in the 20 years cycle of Period 8 (2004-2024). This ultimate cure and also enhancer serves to generate good energy, subdue bad energy and nourish/improve the feng shui of a space so that good fortune continues to grow esponentially. It is also a potent cure for extremely bad situation where other feng shui cures are considered not strong enough to counter a problem. This all-in-one product displays all the eight auspicious objects together which would bring complete good fortune, material luck, spiritual growth, peace, confidence and genuine happiness. 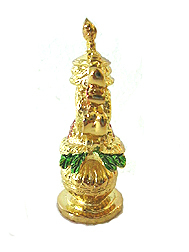 The mystic knot magnifies fortune for Period 8, the conch provides good networking luck, the canopy counter against bad energy, the vase is for abundance, the wheel represents success and improvement, the double fishes represents wealth and money, the lotus for peace and the victory banner symbolizes accumulation of successes. Eight auspicious object is also an important antidote for killing energy, especially for cases where doors are all aligned in one straight line, maindoor opens to a garage, the staircase is facing or too close to the maindoor, the doors are aligned facing each other in a straight line and bad external forces pointing to a specific area of the house. Displaying the Eight Auspicious Objects would also counter malevolent energies of the month either caused by flying stars or one's personal horoscope. It is a protection against bad luck and evil forces.